Here’s a question we get all the time: what’s the difference between pickslanting and edge picking? This seems to be a source of frequent confusion. The two are very different, and do completely different things, but since both involve pick angles and rotation, this can be hard to intuit without a direct visual comparison. The above image is from an animation coming up soon in Episode 3, “Eric the Right”, and is designed to make the difference as clear as possible. Edge picking is a method of attacking the string with the edge of the pick rather than the flat face. When you do this, the sloping shoulder of the pick lets it slide over the string instead of getting stuck. The pick’s wedge shape is the reason this works. The key point to understand about edge picking is that almost every player uses it, even those who don’t think or know consciously that they do. It’s simply very difficult to play guitar at all with zero degrees of edge picking! LEARN FEARLESSLY: Downward pickslanting licks like this one must switch strings after upstrokes when using alternate picking. Sweeping adds flexibility to the toolbox, but only on downstrokes. This is the Eric Johnson and Yngwie system at work. Pickslanting, on the other hand, is a string switching mechanic. Downward pickslanting, which we’ve covered at length in the first two episode of Season 2, enables the pick to escape the plane of the strings every time you play an upstroke. This eliminates the awkward jumping from string to string — which we call “stringhopping” — which you would otherwise have to do to get to a new string. This type of jumping, or stringhopping, is inefficient, and that’s why elite players don’t use it when they’re playing their fastest. If downward pickslanting allows upstrokes to break free of the strings, then upward pickslanting is exactly the reverse. If you’ve watched our Antigravity seminar, then you’ve already seen upward pickslanting at work in the amazing techniques of Michael Angelo Batio, Vinnie Moore, Al Di Meola, John McLaughlin, and Paul Gilbert. Of course, we’ll also see upward pickslanting in later episodes of Cracking the Code Season 2. Finally, for the ultimate in head-spinning confusion, some players use both upward and downward pickslanting in the same phrase. This allows the pick to break free of the strings on both upstrokes and downstrokes. The sophistication of doing this, and the difficulty of discovering these movements by feel without explicitly practicing them, is the reason why playing a simple three-note-per-string scale can sometimes seem like such a herculean feat. We call such elite practitioners “two-way pickslanters” — and in fact all of the players mentioned above fall into this category. The key here is that pickslanting and edge picking are separate processes which occur on completely separate axes of movement. We can extrapolate a coordinate system from the body of the guitar, taking a line parallel to the strings as our X-axis, a perpendicular line intersecting all strings as our Y-axis, and a line protruding perpendicular to the body of the guitar as our Z-axis. In this system, we can describe pickslanting as rotation around the X-axis, and edge picking as rotation around the Z-axis. Most often, pickslanting in the X axis is achieved by rotating the wrist. In fact, many players discover that they have a natural — forgive the pun — inclination toward either upward or downward pickslanting based on hand positions that were burned in, subconsciously, early in their playing career. Judging from the number of elite players who use downward pickslanting, it is probably the more common of the two strategies. To make matters confusing, edge picking is achieved through a combination of both finger and wrist mechanics. Because the two are related, it is common for players to make subconscious adjustments to their edge picking angle as a result of changes in their pickslant. For example, in the Antigravity seminar, we notice that a visible bend, or “bump” in the thumb is often an indicator of upward pickslanting. The trick is that the thumb bump isn’t how upward pickslanting itself is achieved. Instead, it’s a way for the fingers to adjust the edge picking angle to compensate for the pickslanting angle. Nevertheless, because upward pickslanting and the thumb bump very frequently happen together, we can use the thumb bump like a type of forensic evidence to understand picking mechanics that we can’t always see directly. The amazing Vinnie Moore is a great example of this. As soon as he clicks into high-speed mode, the thumb bump immediately appears, his pick locks into upward pickslanting. It’s visually very distinctive, and a classic example of upward pickslanting in action. Here’s probably the most important point of all: neither of these things has to do with speed, any more than the tires on your car have to do with the power of your engine. Picking speed is a completely separate issue altogether, and involves moving the pick back and forth using a variety of different physical methods. Edge picking simply reduces the resistance of that movement. And pickslanting allows that movement to transition from string to string with perfect accuracy. The key is that all three of these can happen simultaneously — in fact, there’s no way around it! If you’re starting to get the idea that picking technique isn’t one problem but really a collection of them, then you’re exactly right. Stay tuned for more episodes of Cracking the Code as we continue our investigation of this fascinating topic. First of all, thanks to this great inside look into developping awesome guitar skills! I’m at the point of changing my whole guitar playing style like holding the pic, using the 45° angle and so on. Your Videos did a great job on motivating me to start getting professional and knowing how to play fast. My problem just now at the time is, that i learned a lot about upward and downward pickslanting and all these different techniques.. But at the moment I’m so much at the beginning, I’m not even quite shure how actually to hold the pick for the best control. I actually had problems with my pic holding, so that i realized i had to change it in order to get faster and gain more control over my playing. Maybe i missed that part, or you left it out because you thought thats already clear to everyone. I saw in one video, that Yngwie uses the 45° angle to the other side as most players would do. That actually feels a little weird to me, is there a trick? Does the holding position of the fingers change compared to the normal 45° angle? Also do you know if John McLaughlin does it the same way with his technique? Since his technique is so crystal clear i try to learn his technique from the bottom on. Maybe you could involve that question either in your videos, or make a small article on that on the blog? that would be the best angle to understand as a player how to imitate that. Thanks a lot to you guys, you rock!! I get the edge picking concept completely and, as Troy says, we all use it consciously or unconsciously. One thing that I’m not sure about, however, is why everyone insists on edge picking with the LEADING edge as opposed to the TRAILING edge. What are the advantages of the former against the latter? Does anyone know / have a view? My query steMs from the fact that I have often used the trailing edge, but, if there are obvious advantages to using the leading edge, I’d be glad to know about them….. I know this is somewhat stale but thought i would chime in. If you use the trailing edge for your edge picking and it is comfortable for you to do so then do it. There are a few players that do this. Neal Schon from journey does this very thing. George Benson does this as well. Most players i think have a feeling that the pick will fly out of their hand if they pick to hard, but shouldn’t be a problem with practice. But try the other one after awhile you will get the hang of that too. Geoff, I was on trailing edge for a while and just started on leading edge. Eric Johnson’s ‘Total Electric’ shows circular picking. It is easier mechanics wise with leading edge to get good range and reach for circular picking. So far, I prefer trailing edge pick hold for the security of pick hold. But I found it limited me on my speed to 60% of the recorded speed of the fast run in Trademark. I am giving the forward edge a try to break through this ceiling. Jeff-Edge Picking and Pick Slanting happens on 2 different Axis and edge picking just means you would choose to pick with the side of the pick rather than the front or flat part of the pick. As Troy stated everyone more or less does this to a certain extent whether you choose to use the leading edge or trailing edge is dependent on your thumb orientation. If you pick and it looks almost like hitchhiker thumb then the down stroke would hit with the trailing edge whereas if your thumb was bent down towards the floor this would be the leading edge . The pick slanting part is the orientation of the pick as it relates to the pick orientation that is parallel to the strings. Say the strings are the X axis and say well if you are an upward pick slanter than the backend the pick is more in the positive Y direction where as a downward pick slanter would be more in the -Y area. An upward pick slanter would be able to do a downstroke and have the downstroke clear the next adjacent string however when doing an upstroke the pick would bury itself into the next string below it almost like a reverse rest stroke. The opposite is true with downward pick slanters. Whether you do trailing or leading edge the downward or upward pick slanting component is not affected. I appreciate the work and effort you’ve put into this, this is huge and substantially changed the way I looked at picking, I always thought that it was all alternate picking and the more you practised the more accurate you got. Never have I thought of all the elements and factors that you explained in Cracking the Code. the thing is though, I struggle to fully understand downward pick slanting. I understand that it’s easier to change strings after an upstroke but is that the only thing to it? Do I have to hold the pick differently? Do I have to change my hand/wrist movement? How do I hold the pick at an 45 angle? And what do I do in case of a 3 note per string situation? I feel like there’s something I am missing and I really want to get this right as it obviously would skyrocket my accuracy. Again, thanks for taking the time to explain all this stuff. Moamen Whether you use your forearm rotation, wrist deviation, elbow deviation, to do alternate picking is a separate function from either downward or upward pick slanting for the most part. Straight even number groupings per string like pentatonics can be done efficiently with one way pick slanting either downward starting on a downstroke and ending on an upstroke or upward pick slanting which would require starting on an upstroke and finishing on the same string with a downstroke. However the key is that when doing the doward pickslanting the forearm or hand is rotated or supinated away from the guitar an arbitrary angle so that when you strike the string on the downstroke the pick is buried and on the upstroke it rises out of the plane of the strings, the Opposite occurs for upward pick slanting whereas the forearm is rotated into the guitar so that when you do a downstroke that it exits the plain of the strings and upstrokes bury themselves. FOr odd notes per string then both downward and upward pick slanting must be used. If you start on a downstroke and end on the same string with a downstroke then an upward pickslant must be used then when you change to the new string where you start and end on a upstroke this should be done with downward pick slanting. the 45 degree angle could be the downward or upward pick slanting or also edge picking although each happens perpendicular to each other. Hi Moamen — and thanks for the great answer, Judd! The most important thing to keep in mind, as Judd mentions, is that it’s most efficient to switch strings after escaping the plane of the strings — which you can do w/ either upward OR downward pickslanting. And for odd # note groupings you can combine them w/ what we call “two-way pickslanting”. There are other solutions for this too, e.g. crosspicking or using some combination of DWPS w/ sweeping / legato (see: the Yngwie “Volcano” method). Plenty of players are primarily one-way pickslanters; plenty others use two-way pickslanting all the time. Anyway, it can get complicated and there are often many different mechanical solutions for a particular thing…many ways of holding & moving the pick that can work. We touch on a lot of this stuff in our YT videos so that’s the best place to start learning more of the basics. The Masters in Mechanics seminars have our most in-depth explanations; we also plan to add more demos / examples to the Season Pass, which is our “core curriculum for picking fundamentals” product. * Trailing edge produces a more aggressive attack and therefore the sound seems more defined, while leading edge causes a softer attack and it also affects the tone a bit. * Pinch harmonics seem to be easier to produce with the leading edge, at least when you’re doing down-strokes. I find that upstroke pinch harmonics are trickier and more unpredictable regardless of the edge one may use. * Trailing edge picking allows stronger grip as the middle finger can join the index to apply pressure against the thumb without interfering with other strings. I’m wondering now how these things influenced our playing when we started playing our first rhythm parts… and then how that affected our solo playing when we were already used to play rhythm in a certain way…? Does anyone here does not use edge picking? I never liked the sound of it and I can’t play as fast as mab but I never needed these techniques. maybe I use pick slanting but I don’t know. But it’s possible to acquire speed with no edge picking right? I don’t have trouble crossing strings because I use the mininum of the plectrum that I need. I do feel I can go faster if I would learn edge picking but I really don’t like the feel and sound of it. Anyone feel or do the same or should I really learn edge picking? The minimum plectrum thing or choking up on the pick is a little red hearing for it does not really help you cross strings better it just makes the problem perhaps a smaller problem as Troy has stated before. 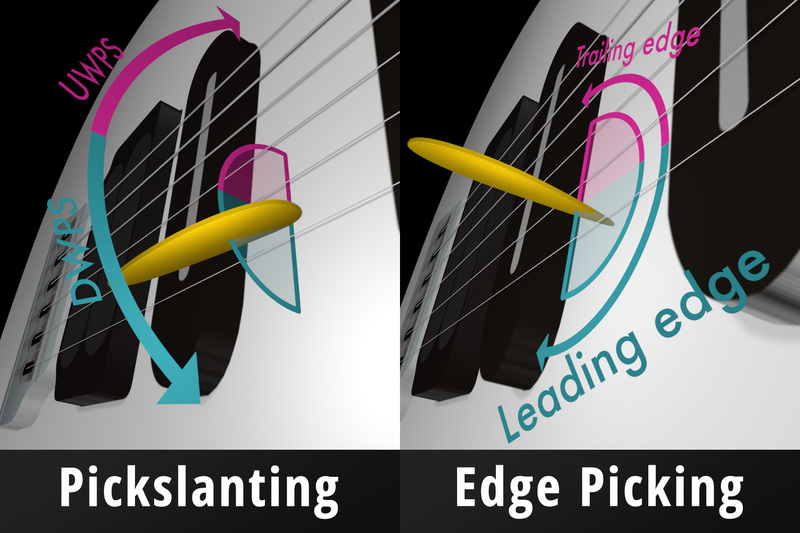 Pick-slanting and edge picking happen in two different planes. One does not need to use edge picking in order to use pick slanting. Edge picking does however decrease the drag of the pick as it slices though the string so it may be easier to glide through the strings faster per say. Pick Slanting is a string switching mechanic and needs to happen in order to cross strings efficiently. Most of the time when I do more complicated single notes per string runs cross picking arpeggios I straighten the edge picking out and focus solely on the rotation of the pick slanting so that it clears the strings it needs to. Sometimes I don’t give it enough and I swipe the next higher string or lower string but cannot really decern this, I just happened to notice it by looking at my picking hand. Hope this helps. I confess I absolutely do not understand. I haven’t watched all of the vids and I’m not sure where to begin, but so far what I’ve seen makes no sense to me and I’m not seeing it. Maybe i’m dumb and I’m a tad frustrated but I’m clearly missing something. Any help would be appreciated! Hey, sorry for any confusion. Hard to help without knowing exactly what you don’t understand, but you should definitely start by watching a few of our videos. Head to our YouTube channel (https://www.youtube.com/user/troygrady) and watch the three episodes of Cracking the Code Season 2, as well as the Vai “Crossroads Diminished” video. Lots more free videos you can check out but those are the best ones to start with and should help clarify this. To dig deeper you can also check out Masters in Mechanics — our flagship seminars (Volcano, Cascade, Antigravity) are super in-depth, several hours each on these concepts. But the free material should be enough to give you a solid basic understanding! If you’re still finding some aspect of this confusing after watching our material, shoot us an email with more detail and we’ll try to help. Welp. I’ve tried and I’ve tried. I’ve watched a bunch of videos, I’ve searched for articles, I’ve incorporated the technique in my playing, I’ve analyzed it within my own playing and I just don’t see it. I absolutely must be missing something. I hear it described as powerfull and necessary yet I don’t get it. I think I may understand it, but I’m not sure at all and any principles I may think I understand do not apply when descending. So I’m not sure if I’ve actually stumbled upon the actual technique. I don’t really know where to begin and I wish there was just a simple exercise that demonstrated this. I often think rather than showing a video of someone playing it very fast and then a slow motion video that’s only slightly slower, why not just play it very slowly in real time and explain the motions and mechanics behind it? I guess I’m just gonna have to give up or find someone to explain it ckearly. I don’t care if I feel stupid if it turns out to be easy, I just want to learn. Thanks for your time. Are you unclear on some aspect of how pickslanting works? When you say you “just don’t see it” what exactly are you referring to? We’re happy to answer specific questions, but want to make sure you’ve done the homework first and watched enough of our stuff to get familiar w/ the basic terminology & concepts we talk about. Otherwise it’s hard for us to help. And as I mentioned, for super in-depth explanations you can check out our seminars. Or you could grab the Season Pass, which comes with an hour-long intro called the “DWPS Pack” that you may find useful. We do plan to add more demos / examples to the Season Pass as well. Hey, thanks for your patience and reply! It’s hard to explain without actually showing it. If I downward slant the pick and do a downstroke (in fact what would you recommend as an exercise? 2 notes picked per string?) and then an upstroke does the pick end up “inside” the string? Is that where im aiming for? As opposed to a more straight, more perpendicular pick where the pick ends up on the other side of the string, causing me to go back over the string to hit the next string which is wasted motion. I see this concept except it doesn’t work when I descend. When I apply this technique I fail to see the advantage which means I’m just doing it wrong or missing a crucial aspect. if you do an even number of notes and use downward pick slanting then this is efficient either doing ascending or descending runs because the pick rises above the string. you might feel that you are further away from the string that you want if you are ascending but it is not really relevant. some people think so but eric johnson is pretty fast with his downward slant either way. When you down three or other odd note groupings per string this delves into the world of two way pick slanting where on one string you are upward pick slanting starting on a down stroke then downward pick slanting on the next string that starts on an upstroke. And upward pick slanting is the exact opposite of downward pick slanting. You should be able to read into this more some of the above replies to learn more about this. I just don’t see the principal applying when descending. I still have to cross over the string to then down pick it after the upstroke. Which is the same if I’m doing it downward slant or holding the pick more perpendicular. Does that make sense? It strikes how incredibly easy this would be if someone were to make a video slowly and easily explaining the principle in all its forms. I’m not trying to be rude but I know the perils of perpendicular when it comes to string hopping. I’m trying to avoid it with the slant. I’m just going to start doing it and see what happens. I have yet to get a clear concise demonstration of it so it’s sorta guesswork at this point. I know it’s just doing it but analyzing doesn’t show a whole lot of difference at various points. The reason I keep asking whether you’ve watched all the episodes of Cracking the Code is because we do go through pretty thoroughly how pickslanting works and why it’s necessary, with plenty of demonstrations! After watching those, should be clear why this applies both when ascending or descending, for even # notes per strings — when you’re using DWPS the pick escapes the plane of the strings to make switching to *any* string easier after an upstroke. This is for DWPS specifically; as Judd mentioned for odd # notes per strings, you’d get into two-way pickslanting, or other solutions like we show w/ the Yngwie “Volcano” example). I just have one stupid question: when using DWPS do you play with the pick at an angle (dwps AND edge picking), or as flat as possible? This question has been ringing in my head since a saw the videos, an answer will be much appreciated. Hey Paul, thanks, glad you’re enjoying our material so far. Yes, pickslanting and edge picking can be (and most often are!) used together. There’s no one “right way” to do it — just as there’s a range of pickslanting techniques (dwps, uwps, 2wps) and string-switching mechanics (elbow, wrist, forearm rotation etc), different players use varying degrees of edge picking. As mentioned in this article, each does a different thing (edge picking reduces resistance of movement; pickslanting facilitates fast/accurate string-switching) and both are important components of picking motion. We recommend experimenting to see what works best for you! When angled forwards as in the diagram above the leading edge will strike the string on a DOWNSTROKE, so does this mean that the Trailing edge will stoke the string on an UPSTOKE? When angling the pick forwards the downstroke comes easily but upstrokes get stuck on the string… Because of the plane of direction the wrist moves in, the pick seems to glide over the string in both directions much more smoothly when i angle it backwards rather than forwards. Hi Ralph. Yes, when you use leading edge picking, the leading edge plays the downstroke and the trailing edge plays the upstroke. And when you use trailing edge picking, the reverse is true. So both edges are used in both orientations – confusing, I know. Maybe we should change the name! As far as smoothness of attack, most picks are symmetrical, so it’s not immediately obvious to me that either one of these methods needs to feel a certain way compared to the other. But of course your hand position may not be symmetrical, and that’s a matter of experimentation on your part. I’ve got to admit – I bought the Pickslanting Primer – and while it’s a great concept, the presentation of the concept leaves a lot to be desired. The problem is the animation – it’s so distracting. I really wish there was more focus on the the actual technique – because most of us who are here are here to change our technique & the only way we can do that is through a clearer presentation. Instead I feel like I paid for a ton of animation and some ideas interspersed. I liked seeing the background – how he came to understand the technique – but I found myself watching and rewatching the videos feeling like I was missing something. I understand all of what was presented – but I had to piece it together across multiple videos. Maybe there could be a more concise “from the absolute beginning/rebuilding your technique from the ground up” sort of video without any of the animation and focuses solely on the actual rebuilding of technique through exercises perhaps, instead of licks. As it is right now I feel like my picking hand is more confused than ever. The Guitar Pro tabs are great, but I feel like I’m left on my own devices to figure out how this works… and it can be done by spending time on it, yes, absolutely, but I’d love to have something to refer to – that is crystal clear – instead of guessing that I’m doing this correctly. My point: this technique has the potential to profoundly impact a players playing… but if it’s not done correctly the risk of adding more problems to your playing seems to be even greater. Andy: The guitar pro tabs are good but if you do not understand the concepts it will only be like all the other tabs out there, But if you understand the concepts then it will reinforce the theory and technique. The videos are pretty concise really in my honest opinion and the animation is there to help you grasp the concept. What you have to understand is that downward pick slanting is when you pluck a string on a down stroke and your pick hits the next higher string say from D string to G string and when you pluck the same string with an upstroke and your pick does not hit the next lower string say from D to A then this is Downward pick slanting. You can have various angles in which the down stroke hitting the higher string occurs but the premise above holds true. For upward pick slanting the opposite occurs. I had a chance to spend the last few hours with the concept – really isolating the movements and really observing where my pick was coming down in relation to the strings and dissecting (with a mirror) exactly where my forearm/hand were and had a bit of an epiphany. I was still bouncing – the motion had just gotten smaller (if that makes sense) – so I was able to correct that with the help of the Pop Tarts lick and all of a sudden things started to fall into place. The pace picked up considerably and while I’m not up to Malmsteen or Troy speeds, I definitely have a better view of what is happening here. No doubt it’s powerful stuff. I immediately started looking at videos of my favorite players and looking at their hands in a whole new way. I guess my first few passes I was distracted by the animation stuff – & combined with Troys delivery (which can be fast for these concepts) it wasn’t quite hitting the mark for me. But once I was able to spend some time with this today… I feel like it’s a different ballgame now. The Pop Tarts lick was the key for me though. Once I put the concept into motion with that – after honestly looking at what my hands were doing – things clicked and all sorts of lights started going off. Hi Andy, thanks for the note. Sorry this wasn’t hitting the mark at first — I know we always have room for improvement in how we present the material, and appreciate the feedback! The animated features were what we started out with, but over time we added another 3+ hours of tutorial-style material (the “chapters” in Pickslanting Primer) to try to better explain the concepts in a more straightforward way. Going forward we’ll think about how we can make this stuff even more clear and concise — we’re always learning new things about not only the techniques but how to communicate the concepts, and aim to keep improving our material as we go. Great to hear you’re starting to make some progress here. And thanks as well to Judd for jumping in to help. Please feel free to email us if there’s anything further you’re stuck on! ‘Pickslanting’ is a notion that’s only relevant because it’s possible to combine both directions of it (which I call ‘∞-picking’ and you call ‘2-way pickslanting’), as a rapid string-switching strategy over a pattern of odd number of notes per string. Based on my observation, everyone naturally slants the top of the pick to some degree when they play. You’d have to make a conscious effort to keep the length of the pick perpendicular to the strings, which would be very difficult to maintain. So when Yngwie clears those odd-notes-per-string runs at high speed with great accuracy, do we really need to care whether, or in which direction, he slants the pick? It appears to me that all we should care about is that if he can’t switch strings on an upstroke by strict alternate picking, he will either sweep it or change the last note to legato. Theoretically, anyone practicing those patterns will end up clearing them at Yngwie speed/accuracy as long as they followed those rules, without ever knowing about pickslanting. The pick slant is conducive to the direction being played. You wouldn’t sweep an ascending arpeggio with and upward pick slant and same in reverse, yet if people are having trouble with an Yngwie line, one of the boxes to tick is definitely, does my slant help or hinder this line? the point is Yngwie only plays odd number of notes when going from low to high because he using sweeping to go between the strings. He would not do odds when going from high to low unless he started on an upstroke. The terms leading edge and trailing edge a bit strange. I prefer outside edge and inside edge like the Brooks pack describes. If I play with the inside edge like George Benson, that IS my leading edge. And if I tilt it like Yngwie, that becomes the leading edge. Previous PostHappy New Year from Cracking the Code! Next PostIntroducing the Masters in Mechanics Video Series!